The new release is really what the game's title suggests. 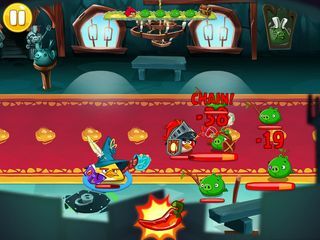 Angry Birds Epic is an absolutly new experience for the fans of the game. You can easily avoid all the purchases and still enjoy the battle between the two groups. Their new roles represent their abilities like explosions or spells. It is fun to explore all that is available for you here. The birds that you know are supposedly fighting with the pigs for the stolen eggs. And the whole fight is more throwing yourself onto the concrete structures. But this time the battle really gets EPIC as the gangs take more of a personified look and several new abilities. The birds are just an explosion of cuteness and awesomeness as they take on the new roles. The black one is a pirate for example, and the white bird is a healing master. Their new roles represent their abilities like explosions or spells. 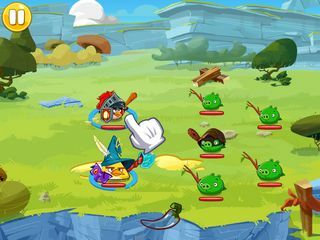 But some of them even have additional abilities which makes it so much fun exploring all that as you fight against the pigs. You can get a ton of some useful info just by tapping and holding onto the characters or items. It is important to strategize here when using helmets. Try to get as much done as possible with little damage to get more stars at the end and be able to get the treasures and component materials. This is the game that you need to dive in for a while to see how everything works, which most gamers will probably be grateful for.